14-way, high-impact polypropylene top. Air-Mesh cushioned dividers. Molded putter well fits oversized grips. Integrated "soft touch" lift handle. 10 pockets (2 large apparel). Approximately 5� lbs. Insulated beverage pocket. Integrated trunk handle. Cart-strap channel identified by micro patch. Water-resistant, velour-lined valuables pocket. Molded cross-design bottom fits securely on motorized and pull carts. Zip-off, customizable ball-pocket panel. Style, efficiency, convenience and versatility combine to make the lightweight but strong Traverse bag a great companion to your round. 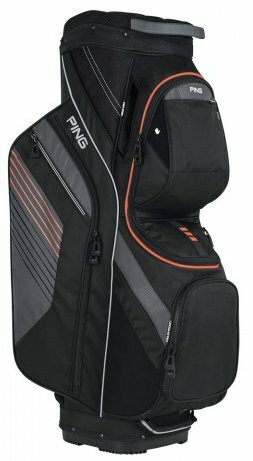 At approximately 6 lbs., this model blends the easy handling of a carry bag with the generous storage and added features of a cart bag. The gusseted, drop-down ball pocket on the new-look Traverse bag has room for two-dozen balls, the insulated cooler pocket keeps beverages close at hand, and a 14-way top simplifies organization. This lightweight workhorse has 10 roomy pockets to accommodate your belongings.